Derby enhanced their Championship play-off hopes as Martyn Waghorn's hat-trick powered them to their biggest win of the season against a poor Rotherham side. 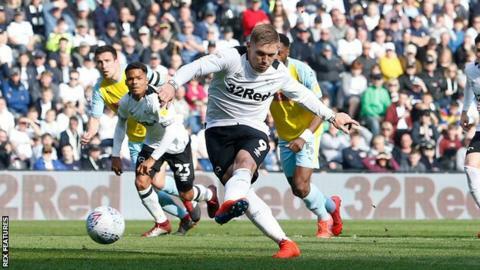 Waghorn gave the Rams an early lead from the penalty spot after Mason Mount was tripped and then nodded home within three minutes of Bradley Johnson's header doubling Derby's advantage. Mount scored with a tidy finish from Jayden Bogle's cut-back after the break before Richard Wood headed in a consolation from Joe Newell's corner. But Duane Holmes tapped in a fifth, and Waghorn ensured Derby scored six for the first time at Pride Park with his second penalty after Tom Lawrence was brought down. Frank Lampard's side were looking to revitalise a stuttering play-off campaign, while the Millers were keen to end a miserable run of seven straight league defeats at Derby after chalking up their first league away win of the season on their previous outing. The hosts started impressively, but Rotherham almost levelled when Bogle cleared off the line from the in-form Semi Ajayi, who was inches away from a ninth goal of 2019 from a Newell corner. But United saw their hopes of climbing out of the bottom three sunk by half-time, with their frustration typified when team-mates Jon Taylor and Jerry Yates squared up to each other. Despite being out for almost two months with a hamstring injury, Chelsea loanee Mount hit the ground running on his return and was instrumental in the Rams' rout, keeping the hosts ticking and the tempo high. Newell impressed for the the visitors and his chip hit the bar, but the Millers were already a well-beaten side by that stage and remain third-bottom, a point behind Millwall. After a run of three straight league defeats, Derby are now four matches unbeaten and moved into the final play-off spot ahead of Middlesbrough, who slipped to eighth after losing to Norwich. "The performance was top level and I'm delighted with the goals because we've been playing pretty well at times but not scoring enough which has been a problem recently. "When we play like that we are going to give everyone in this league a tough game. "When you are on top, you have to take your moments and we did that and killed the game very early. "My message at half time was not to come off it because I wanted them to make a bit of a statement, and I'm not talking about statements to everyone else but to ourselves and what we can do." "I don't think 6-1 flattered them if I'm honest, but I don't remember my goalkeeper making many saves either. "I'm disappointed and a little bit embarrassed because I don't think that sums up our season, it's not how we are. "I'm not blaming the lads, it's my fault. I prepared the team with the coaching staff, we prepare the tactics, but the simples weren't very good today." Match ends, Derby County 6, Rotherham United 1. Second Half ends, Derby County 6, Rotherham United 1. Attempt missed. Harry Wilson (Derby County) left footed shot from outside the box is high and wide to the left from a direct free kick. Corner, Rotherham United. Conceded by Ashley Cole. Substitution, Rotherham United. Anthony Forde replaces Jerry Yates because of an injury. Delay in match Jerry Yates (Rotherham United) because of an injury. Attempt missed. Scott Malone (Derby County) left footed shot from the left side of the box is high and wide to the left. Assisted by Jayden Bogle with a cross. Goal! Derby County 6, Rotherham United 1. Martyn Waghorn (Derby County) converts the penalty with a left footed shot to the bottom left corner. Penalty conceded by Marek Rodák (Rotherham United) after a foul in the penalty area. Attempt blocked. Billy Jones (Rotherham United) right footed shot from the centre of the box is blocked. Assisted by Matt Crooks. Attempt missed. Matt Crooks (Rotherham United) right footed shot from the centre of the box misses to the left. Joe Newell (Rotherham United) hits the bar with a left footed shot from the left side of the box. Assisted by Billy Jones. Offside, Rotherham United. Richard Wood tries a through ball, but Jerry Yates is caught offside. Goal! Derby County 5, Rotherham United 1. Duane Holmes (Derby County) right footed shot from very close range to the bottom right corner. Assisted by Mason Mount. Attempt missed. Mason Mount (Derby County) header from the centre of the box is close, but misses to the right.